My thanks to all who attended the Lecturers’ meeting on March 22. We had a nice crowd and discussed what’s happening now and what we can expect in the future. We discussed a new project which we hope will help get the news out about what our Granges are doing. 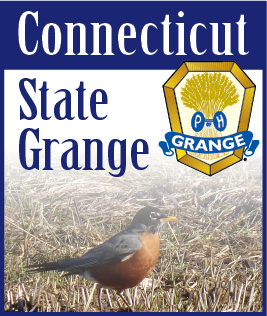 If your Grange has a special program or event scheduled you can mail (424 Cedar Lane, Cheshire, CT 06410) or e-mail (lecturer@ctstategrange.org) me the details and I will send out the information to all on my e-mail list. I would like information thirty days in advance but will accept it later. The hope is to send out e-mails twice a month, but this may change depending on how much info I get. Please, still send your information to the CT Granger. This is just an added incentive to get people out visiting. We all need to support one another. Our “A Number” Contest and Talent Contest will be judged Sunday afternoon June 14th, also at Cheshire Grange Hall. Why not make a day out of it? Charles Dimmick will be conducting his first Grange Sunday Service at 11:00. This will be followed by a Shepherds Pie Dinner prepared by our new Youth Committee. The Lecturers part of the day will begin sharply at 1:00.
the south side we finally have crocus and snowdrops open.